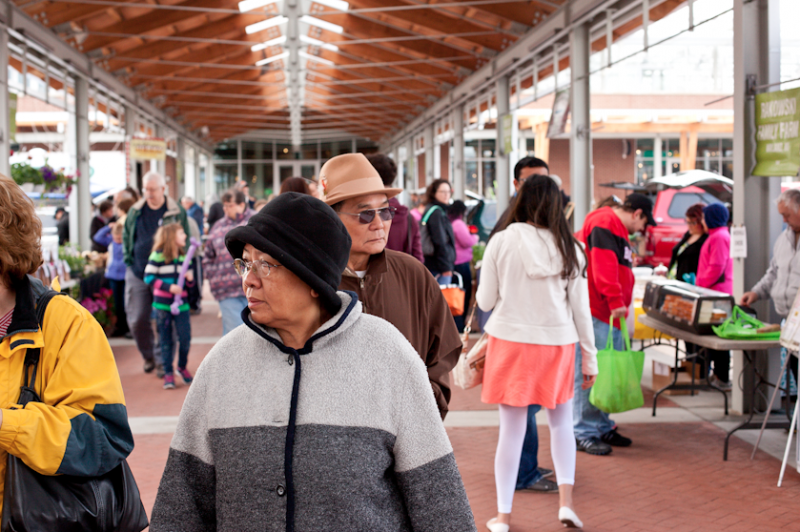 We launched our second season of our outdoor market this past Saturday at the Downtown Market. The number of farmers and fresh food options is expected to swell in coming weeks, with more than 50 total vendors participating. 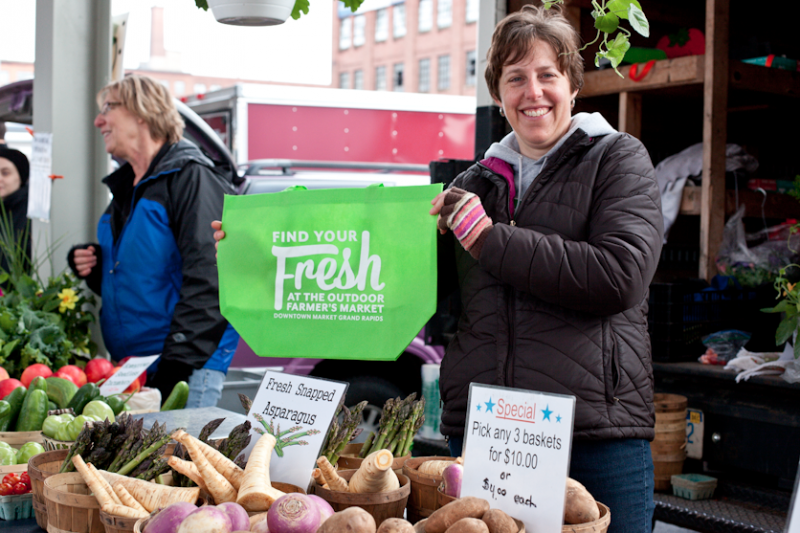 The Grand Rapids Downtown Market rolled out the “fresh” with the reopening of the Outdoor Market for its second season as Downtown Grand Rapids’ only farmers’ market. Thousands of eager shoppers bought fresh, local produce and food items from 30 farmers and food artisans under the Outdoor Market Shed on Saturday, May 3. 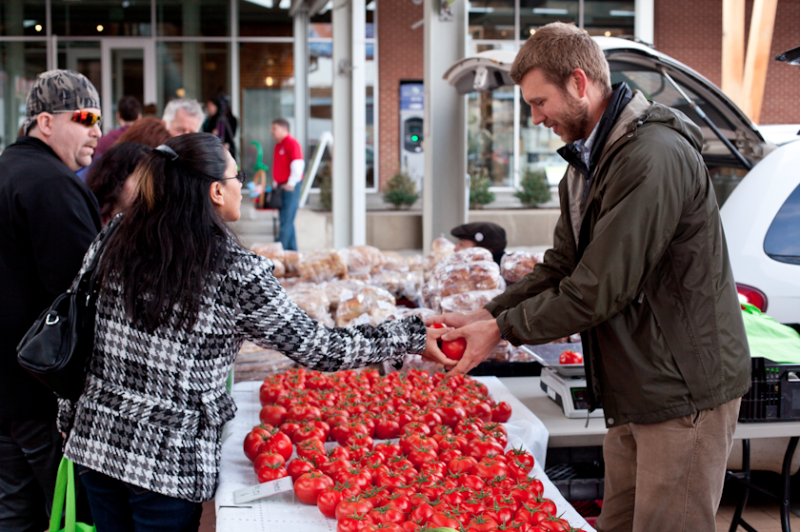 The number of farmers and fresh food options is expected to swell, with more than 50 total vendors lined up for the 2014 season. 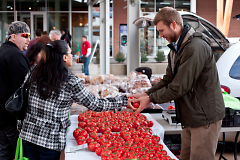 2014 marks the first season that the Outdoor Farmer’s Market and the Indoor Market Hall are open for the full summer together, bringing together a marketplace of prepared and freshly grown items that is unmatched in Michigan. To ensure that all residents can take advantage of fresh and healthy food, eligible Outdoor Market vendors are accepting SNAP/EBT/Bridge Cards. In June, the Double Up Food Bucks program will return, rewarding Bridge Card users by matching the amount spent on fresh fruits and vegetables, up to $20 per day. Also beginning June 1, vendors will begin accepting Market Fresh/Senior Project Fresh and Project Fresh/WIC. The Outdoor Market season opening was marked with music from Hugh DeWitt inside the Market Hall, a free yoga class in the greenhouse and a microgreens tasting class. Chef Rose Ribbens also hosted the first of the season’s “Chefs at the Market” series, focused on dishes made from rhubarb, including pickled rhubarb and a rhubard compote for yogurt parfaits and crostini. Visitors browsed and shopped for locally-grown flowers, fruit, vegetables and locally-raised meat and dairy products as well as locally-made baked goods, honey, maple syrup, sweet treats and more throughout the day, and the first 500 were rewarded with free, reusable Downtown Market shopping bags. Although it’s early in the season for most produce, many vendors had flowers and early season crops for sale, including potatoes, beets, leeks, lettuce, kale and spinach. Some local famers with greenhouses are already harvesting tomatoes and herbs as well. The Outdoor Market adjusted its hours for 2014 to fit shoppers’ schedules, and is open on Saturdays only in May from 9 a.m. to 2 p.m. From June through September, the Outdoor Market is open Tuesdays and Saturdays from 9 a.m. to 2 p.m. and Thursdays from 4 p.m. to 7 p.m. In October and November, the Saturday-only schedule returns. The combination Indoor/Outdoor Market brings new collaborations in the popular “Chefs at the Market” series, a free class featuring Indoor Market vendors, every Saturday morning at 10 a.m. through September, with chefs including Kate Leeder (Aperitivo), Mario Cascante (Tacos El Cunado), Chris McKellar (Love’s Ice Cream) and Anissa and Jermale Eddie (Malamiah Juice Bar) making dishes such as crostinis, mozzarella, smoothies, Caribbean jerk chicken, herbal ice cream and salsa. Starting in June, the Downtown Market will host “Kids at the Market” activities including hands-on arts and crafts, music, dance, fitness and education activities from 10 a.m. to noon on Tuesday mornings. For more info, visit our website.